Basic elements of the triangle offence, which has many options. The offence is a sideline triangle on one side and a two-man game on the other, with proper spacing (15-20 feet between players). It provides a framework for players to read and react to the defence, with constant ball and player movement based on certain rules. Spots can be filled by any player, including a guard in the post. An asset of the offence is the chance to isolate the post and attack his defender. The post should play on the "line of deployment", which is a line between the ball and the basket. To play a standard defensive position between the post and the basket, his defender must play behind (shown), an easy pass from the wing. If X5 overplays on either side, 3 can pass to 5 on the open side. 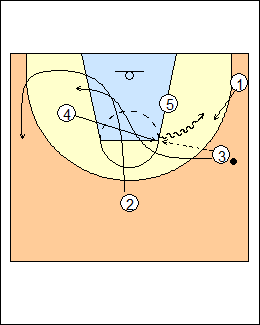 coachesclipboard.net - if X5 half-fronts from the top, 5 seals on a pass to the corner. a) If X5 fronts the post, 3 has the option of a lob pass or a quick pass to 1 or 2 to get the ball inside. 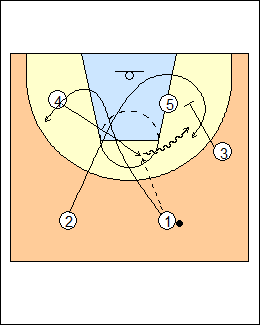 coachesclipboard.net - 3 makes a lob pass, or feed the post from the top, 5 seals as a pass goes to 2.
b) 4 is on the weakside wing, behind the 3-point line. 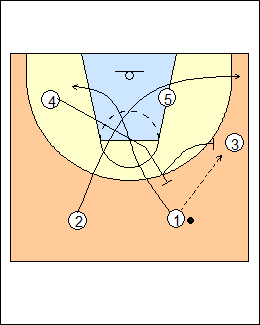 This spacing and triangle concepts are used in many other offences, usually with a trailer at the top of key, see Offence - New Jersey Nets, Fast breaks - North Carolina, Spurs 2007. The triangle can be formed in many ways, e.g. 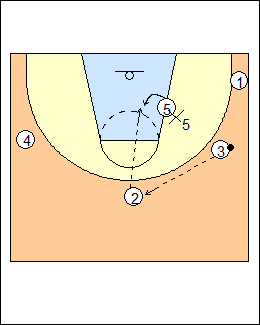 1 passes and cuts inside or outside to the corner, or dribble pushes 3 down to the corner. Using two guards allows shared ballhandling and prevents defences from ganging up on one point guard. 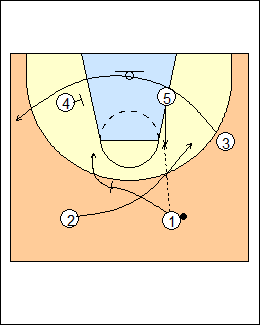 Solo-cut series - 1 passes to 3, basket cuts and clears weakside (a two-man game for 3 and 5). 3's passing options, in order, are 5, 2, 4, then 1. - 3 screens for 4, 1 cuts baseline. Here 5 can make a fan pass to 2 spotting up at the fan (or garden) spot. Form a new triangle on the other side, re-start the offence. Del Harris - if the ball is passed into the low post in a wing-corner triangle, the corner must cut hard baseline, the wing stays ballside unless he screens away at the top for another player. In a two-man game (wing and low post), the wing should cut hard baseline or drift to the corner, then the next man on top must move ballside at least two full steps past the vertical line of the ball, don't load up the weakside. Chris Oliver - the high player basket cuts, the corner player fills out to the 45, 5 can pass and ballscreen. See Tactics - Passing into the low post. The second look is 2, who can shoot or pass to 5 (ducking in), to 4 (moving toward the ball), or to 1 coming off a screen by 3. If overplayed, 4 makes a backdoor cut, if that's not there he pops out to the elbow area for a pass from 2, who speed cuts and gets the ball back (or 4 fakes a hand-back). Don Kelbick - 4 can step up ballscreen. 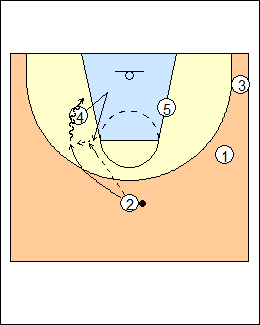 If 5 and 2 are overplayed, 4 flashes to the ballside elbow (the "backdoor step"), gets a pass, 2 makes a backdoor speed cut. 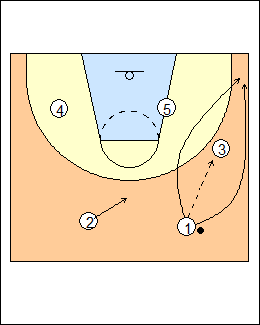 3 can cut right after 2 (or screen away for 1), if 2 and 3 aren't open, 4 can make a dribble hand-off to 1. 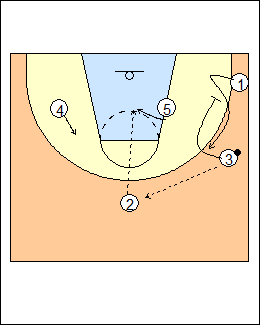 4 can start to flash then backcut for a lob pass if overplayed. Oliver - on a pass to the backdoor spot, the top player can backcut or flare. See Quick hitters - Elbow flashes. 3 passes to 1 in the corner, makes a banana cut to the basket, 5 comes up to the ballside elbow then picks and rolls. 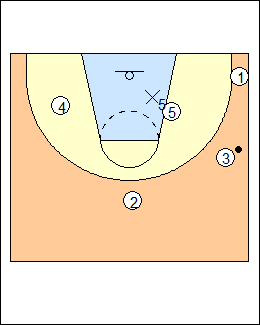 On ball reversal, 2-3-4 would form a sideline triangle on the other side. When 1 is bringing the ball up the floor, 3 should pop out to the wing so he can get a pass when 1 gets within three feet of defender X1 (the moment of truth). If 3 is not open, 1 passes to 2 three feet or more behind ball level (the lag principle), 4 pops out for a pass, then set up a sideline triangle (e.g. 1 cuts to the corner). Options if 3 and 2 are overplayed. 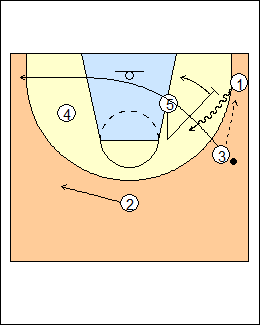 4 flashes high, gets a pass, 2 makes a backdoor speed cut, 1 follows and clears weakside, 3 downscreens for 2, here 4 makes a dribble hand-off to 2 coming off the screen (2 could pop to the corner for a pass). 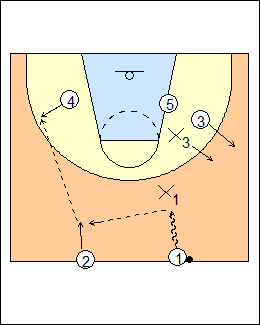 4 can pass to weakside 1 and follow to ballscreen (or stagger screen with 3 for 2). Variation - 2 backcuts first, then 4 cuts off 2's backside (a blur screen). See Quick hitters - Duke actions (Flash), Offence - Seth Greenberg slice (Floppy pressure release), Fast breaks - Florida 2005, Florida 2006. 4 flashes high, 2 backcuts, 1 can't pass to 4 so he passes to 3, 4 backscreens for 1 then ballscreens for 3 (and can then screen for 2). - 2 backcuts first, 4 flashes high and isn't open. 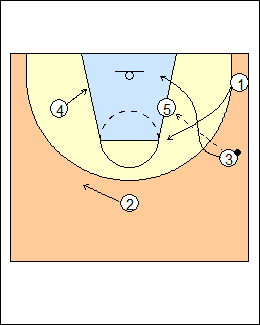 2 and 3 are overplayed, 5 flashes high for a pass, 3 backcuts, 1 screens away for 2 then gets available for a pass.